The mysterious disappearance of a Saudi journalist, Jamal Khashoggi, from inside the Saudi Embassy complex in Turkey on 2 October and an array of circumstantial evidence surrounding his disappearance lead one to suspect that Jamal was possibly abducted and murdered by a 15-member death squad, sent by the Saudi Government. Originally, the Saudi authorities vehemently denied the allegation but according to President Trump, the king now suspects that “rogue killers” may have carried out that grotesque act. In saying so the President is either putting his own words into the king’s mouth or acting like a mnemonist to trigger the Saudi ruler’s mind to grab that theory and use it as an escape route. At the same time, Trump has also warned of unspecified but “severe punishment” if allegations against Saudi Arabia were to be proved. Meanwhile, Turkish authorities, in cooperation with Saudi government, are apparently searching for clues with a team of forensic experts and sniffer dogs. The world is outraged by the disappearance of yet another journalist at the hands of Saudi Arabians. In 2004, Simon Cumbers attached to BBC was shot and killed by an Al-Qaeda gunman, in As-Swaidiin Riyadh, for photographing the house of an Al-Qaeda member who was shot by the Saudi police a year earlier. Journalists are becoming an endangered species in tyrannical regimes. Even if the Saudis were to be found guilty of Khashoggi’s murder what possible “punishment” would US and its allies inflict on Saudi authorities? US has, in the words of George W. Bush, an “eternal friendship” that actually started in 1945 when American President Franklin D. Roosevelt, while returning from the Yalta Conference, met the “robed, resplendent” King AbdulazizIbn Saud aboard the USS Quincy cruiser in the Suez Canal. It was not a friendship between two innocent hearts but a marriage of convenience to achieve one’s global aspirations as an emerging imperial power and the other’s desire for international recognition of an artificially created country with a tribal monarch. Historically, Saudi Arabia owes its origin as a distinct geographical and political entity to Colonial Britain. It was this former imperial power, with its imperialist agenda to weaken, split and destroy the Ottoman Empire, that created Saudi Arabia as a wrecker of that Muslim caliphate. From that time onwards the desert kingdom has always remained a loyal agent of Western hegemons. When the seat of imperialism shifted from London to Washington, comprador Saudi Arabia, with its vast oil wealth discovered by foreigners and a contractual commitment to uphold, protect and promote the ultra-orthodox Salafi religious doctrine became an in indispensable US ally. In return for this so-called eternal friendship, which can only last as long as oil remains the lifeblood of modern industries, the super power decided to ignore any call from any source for intervening in the tyrannous governance of Saudi monarchy, and instead, resolved to supply the Saudi Government for cash unlimited quantities of modern weapons to kill dissidents and keep the masses under permanent control. What those weapons are now doing to thousands of innocent children and women in Yemen is public knowledge. US foreign policy rooted in advancing freedom, democracy and human rights lost all credibility in its relations with Saudi Arabia. The merchants of death in US, with their control over the media and influence in the congress have no qualms in supporting this marriage of convenience. The US military-industrial-congress complex is happily in bed with Saudi tyrants. One can gauge the closeness of this diabolical friendship from one single fact that when 15 of the Saudi citizens hijacked and crashed two jumbos on theTwin Towers in New York and killed 2996 innocent civilians, US took its revenge not by bombing Saudi Arabia but Iraq and Afghanistan under false pretentions. Also, after the FBI investigation into the New York disaster 28 pages of its report said to have implicated Saudi Arabia were censored and still not released. It is behind this cosy relationship with the superpower, which puts profit before principle, that Saudi rulers are conducting their surveillance over recalcitrant scholars, thinkers, journalists and activists who are agitating for democracy and constitutional change. From the several militant Islamist groups that metamorphosed into Al-Qaeda and which led to the 9/11villainy was born the Saudi Association for Civil and political Rights (ACPRA) in 2009, which agitated through petitioning the government for political representation, elected government, accountability and respect for citizens. It called for the transformation of the absolute monarchy into a constitutional one. In 2013, the government responded to its call by imprisoning most of its founding members. In 2010, Muhammad al-Abd al-Karim, an assistant professor of Islamic jurisprudence was thrown into jail for a couple of months for posting an article questioning the legitimacy or otherwise of the succession struggle within the royal family. When he was released he was suspended from his teaching job. Muhammad al-Ahmari, is a Saudi scholar trained in Britain. He is a prolific writer who appears in the popular media regularly to advance his thoughts on democracy and need for constitutional reforms. For a while, the Saudi government, because of his media charisma, tried to buy his loyalty to the regime, but al-Ahmari, being an honest intellectual, chose to migrate to Qatar and become a Qatari citizen. He continues to write from his adopted country that honours him as an intellectual. The Salafi establishment in Saudi Arabia however, is carrying on a campaign of character assassination against him. Sheik Salman al-Awdah, a veteran of the religio-political movement known as Sahwa in Saudi Arabia is an admirer of the Arab Spring. Through a new interpretation of Salafism and its theological grounding he has come to justify even a revolution to bring about political changes. He is banned from travelling abroad and his writings and movements are under close surveillance. Similarly, Abdullah al-Maliki, another controversial intellectual is questioning the established assumptions about the application of sharia in contemporary society. The writings, lectures and discussions of these intellectuals and activists are reaching a wider audience through foreign and social media. 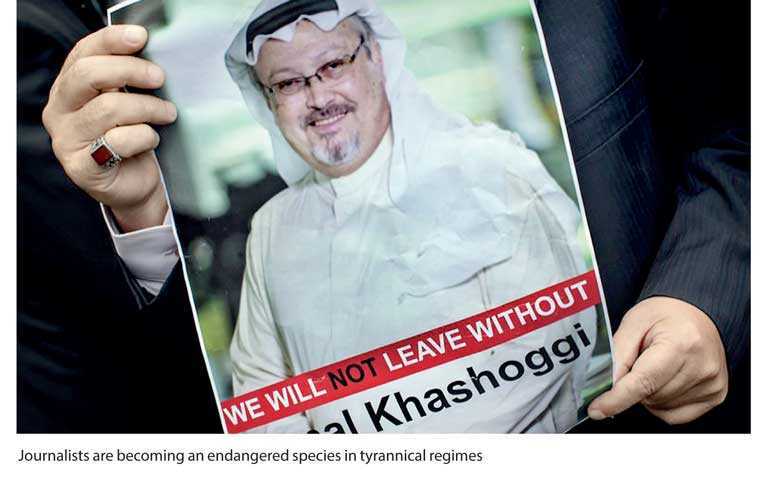 Journalists like Khashoggi who may have gathered more sensitive information about the regime and with his connection to internationally respected media was becoming a source of embarrassment and politically dangerous. This may be the reason why he mysteriously disappeared. However, the question now is, what will the US do if the regime is found guilty? The short answer is NOTHING that would jeopardise the eternal friendship cemented with cash and carbon. To the superpower profit is more important than principle.